Practice making patterns with shapes. 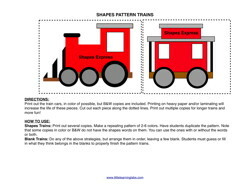 12 common shapes are included to practice making patterns with. A few activities are included, but you can make up your own, too! Practice making patterns with shapes. 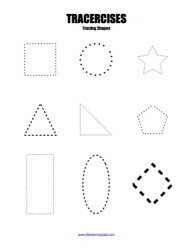 6 common shapes are included with or without the names of the shapes. They are both in color and B&W, in case you can't print in color. 12 common shapes are included with the names of the shapes on them for more advanced play. They are both in color and B&W, in case you can't print in color. This themed story pack includes 12 short stories about shapes and geometry, written for beginning readers, from grades K-2. 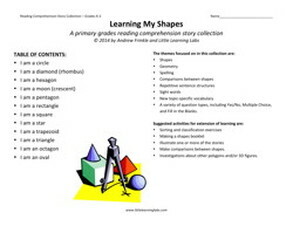 Each of them focuses on a shape and its characteristics, and is a quick read with 5 comprehension questions. An answer key is included. •	A variety of question types, including Yes/No, Multiple Choice, and Fill in the Blanks. Included are suggestions for extensions to learning to help stretch learning into a unit. 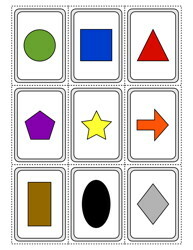 Practice learning your basic colors and shapes with this 9-card set. Included are activities and extensions for more learning! 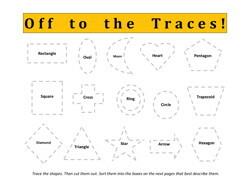 Trace these 15 different shapes and then practice sorting them into categories like: pointy, rounded, symmetrical, non-symmetrical, parallel sides, no parallel sides. Some categories are pretty advanced, but can be good up to 2nd or 3rd grade even! This is an excellent classifying strategy. 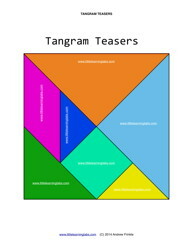 Practice making different shapes with these geometric, full-color tangrams. There are 35 different shapes to make on little cards that show the solutions. Students only need to copy the shapes they see, which takes some fine motor control and the ability to copy a geometric shape. There is a lot of good color, spatial organization, geometry, and pattern recognition here! 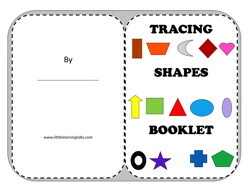 Make your own booklet of tracing shapes. 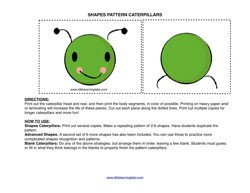 This booklet can be printed double-sided and folded up to make a nice booklet for each student. Practice coloring them and tracing the shapes. 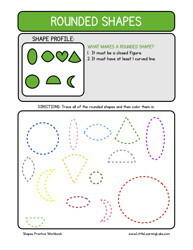 Shapes included are: rectangles, trapezoids, moons (crescents), diamonds, hearts, arrows, squares, triangles, circles, ovals, rings, stars, crosses, and pentagons. Practice tracing shapes as a basic skill! Many shapes or parts of shapes like circles are actually included in our letters and numbers. Practicing to draw them is a great basic math, shapes, and writing skill! Practice with a set of color or B&W lines. Some versions also have the name of the shape included.